FREE Albertsons Monopoly Game Pieces — Claim Yours! You read that correctly: FREE Albertsons Monopoly game pieces! There three ways to score them without having to shop at any store affiliated with Albertsons, and all are well worth the added effort, since they will save from having to make a lot of trips to the store, since any size purchase gets you a ticket. You need a large number of tickets to get anywhere near a prize for Monopoly Shop and Win. The odds are significant because that the parent company, Market Stores, owns a total of 2,035 locations that are participating. In addition to Safeway and Albertsons, there’s Pavilions, Carrs, Vons, Randalls, Eagle, Pak ‘n Save, Tom Thumb, Jewel-Osco, Acme Markets, Shaw’s/Star Market, United Supermarkets, Market Street, Amigos, United Express, Lucky (Southern California only) and Super Saver. Just because there are 2,035 stores that offer the game doesn’t mean you should go shopping that many more times to get the game pieces. With that in mind, here are the three ways to get free Safeway and Albertsons Monopoly game pieces. Envelopes and postage cost a lot less than the amount of groceries you need to buy to get Safeway and Albertsons Monopoly game pieces — which makes the old-fashioned self-addressed stamped envelope (SASE) approach the most straightforward way to obtain tickets free of charge. 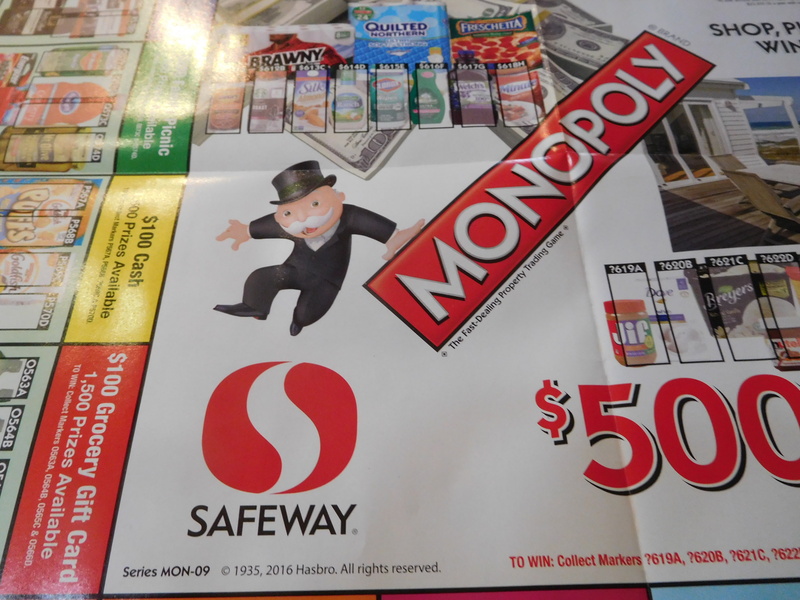 The official rules for Safeway and Albertsons Monopoly still state that you can include a SASE in an old-fashioned postal letter to: MONOPOLY MON-11 Collect and Win Game Ticket Request, Attn: Promotions Coordinator, P.O. Box 965068, Marietta, GA 30066. The mail-in requests must be received no later than May 9, the last date tickets will be distributed for the promotion. Each request must be mailed in individually and legibly addressed. Submissions in business reply envelopes will not be considered. Other restrictions do apply, so you’ll want to read the complete rules in order not to miss anything. Once you send in your request, you will receive one game ticket and one bonus game ticket, for a total of two tickets. I’s also important to note that the online prizes are different than the Collect and Win portion of the game. Another strategy might not technically work out as free tickets because you would need to trade something of value for the game pieces. Websites where people barter — including but not limited to Craigslist — typically include listings of Albertsons Monopoly game pieces during the season of the promotions. You’ll be able to find more of these opportunities if you remember to do additional searches on each of the different grocery brands that are participating. You could even post an ad in one of the wanted categories on Craigslist and explain that you want to pool Monopoly game pieces with people who’ve shopped at all the different grocery brands that participate in the promotion. Search skillfully — and often 00 and you just might find people who are willing to give away their extra tickets so you don’t have to fork over anything first. Talk to all of your friends who shop at any of the grocery stores that are participating in the Monopoly Shop and Win and you might also find it better to pool your resources in order to improve your odds. The wider the circle of friends you reach out to, the greater your chances of obtaining multiples of the same ticket. Most likely at least some of your friends are throwing away playing pieces after they get home from the market — get them to give you any they might have tossed otherwise. In sum, the more people you can pull in to work together on this event, the better your chances may be of winning. And if you combine this strategy with the other two mentioned in this article, plus you still buy groceries, then things really start to add up. Readers, are you seeing the promotions for Monopoly game pieces are your favorite stores yet? Which grocers are your preferred locations?